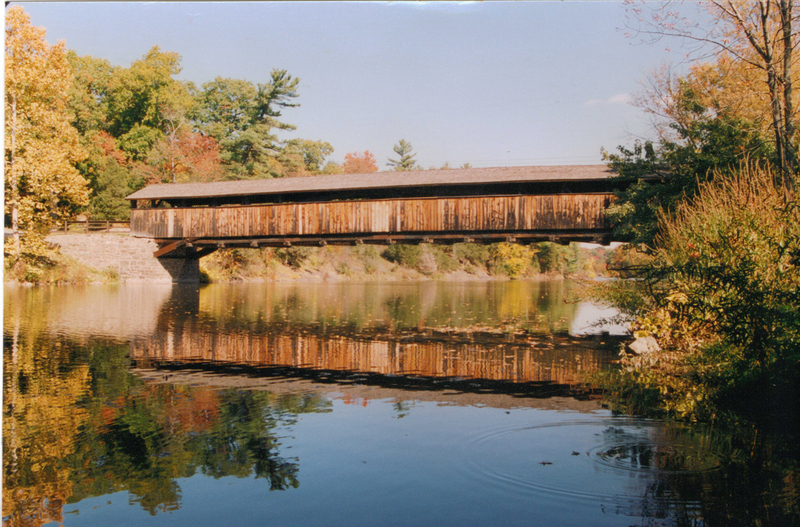 The site for Perrine’s Covered Bridge had been in the Town of New Paltz since 1677. 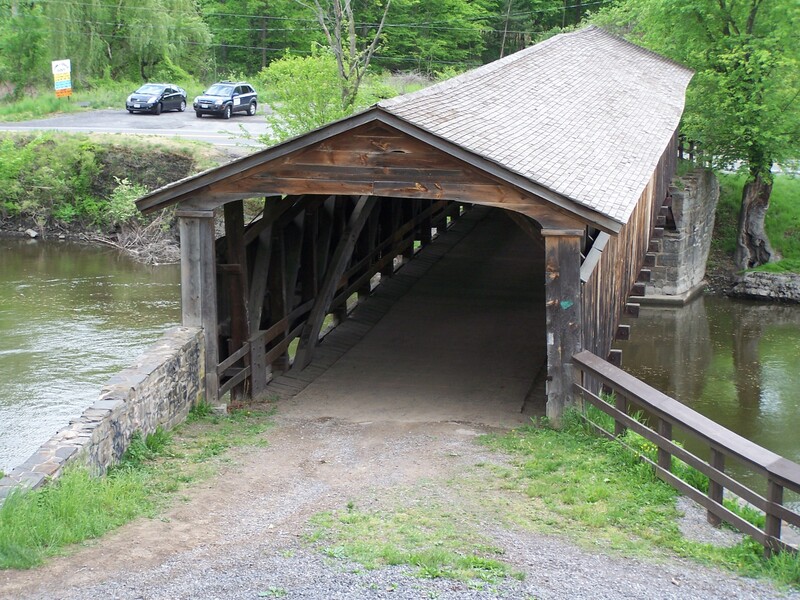 However, by the time the covered bridge was built in the late 1840s, the southern embankment of the bridge was in the Town of Esopus, which was enlarged in 1843, and the northern landing was in the Town of Rosendale, which was formed in 1844. Perrine’s Bridge was named after James Perrine (1801-1860), son of French immigrant James W Perrin and Huguenot descendant Catherine Freer, who operated a hotel and tavern starting in the 1820-1830s on the south side of the Wallkill River at the site that subsequently was chosen for the covered bridge. Nearby areas were part of the Perrine farm. New York State Ulster County Board of Supervisors’ records show that a bridge was authorized “near the house of James Perrine” in 1822 and again in 1834, and there is good evidence that a timber bridge was completed on the site by 1823 and likely rebuilt in 1834, but it is not clear whether either of these was covered. 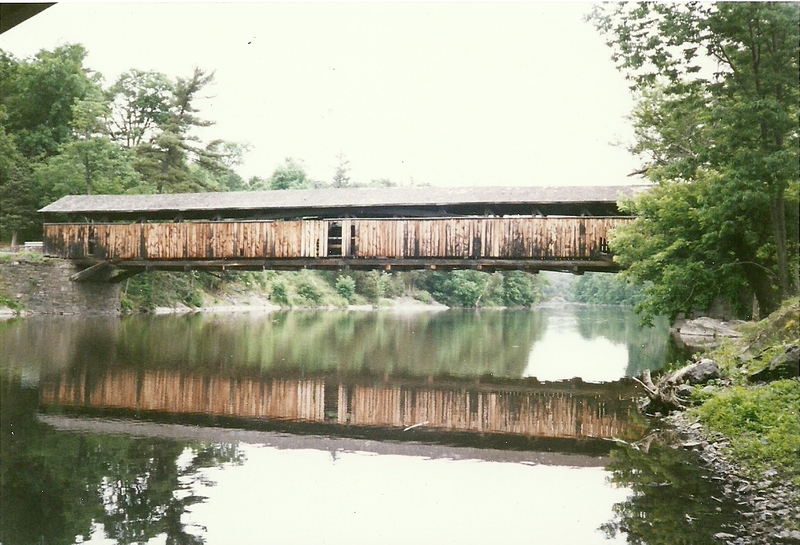 It was not until after the subsequent authorization in 1846 that construction actually began on the covered bridge we see today that was completed sometime in the late 1840s. 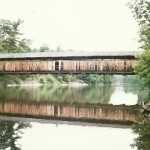 It is not possible at this time to determine the exact date of completion or the nature of any of the three authorized timber bridges because the Board of Supervisors’ Minutes from 1807-1828 and 1837-1861 are missing from the Ulster County Archives. 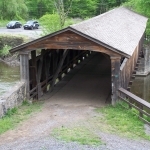 The construction of three covered bridges—Perrine’s, Phillies, and one in the village of New Paltz—across the Wallkill River within fifteen miles in the same decade all helped connect the area to communities beyond when a network of new roads was also being laid out. At the time of the construction of Perrine’s Bridge, there were nearly twenty mills and factories in Dashville adjacent to two waterfalls along the Wallkill River that was only ¾ mile from Perrine’s Bridge. The Dashville industrial complex supported more than a thousand workers who, beginning in the early 1800s, spun cotton into yarn then subsequently cloth itself before diversifying to produce everything from wool blankets and carpets to cotton products, flour, knives and lumber. The construction of Perrine’s Bridge made it easier for workers from the Tillson area of Rosendale north of the Wallkill to work at the Dashville mills. 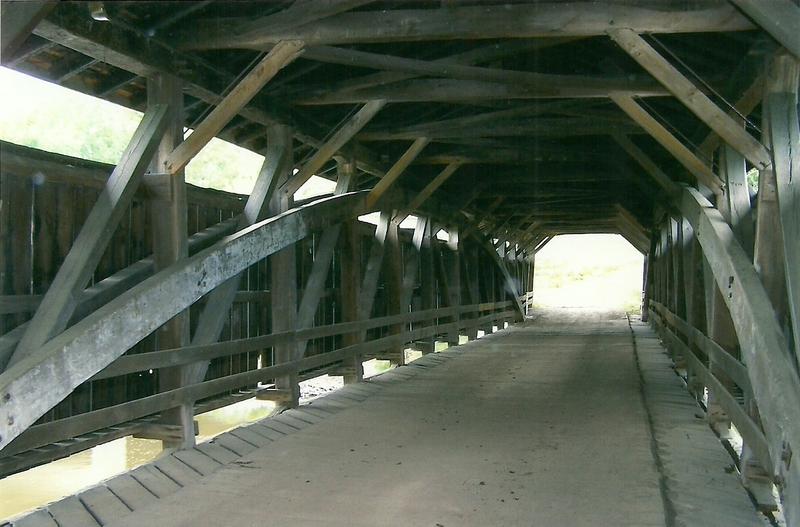 Rosencrans Wood chose locally available raw materials for his late 1840s covered bridge. Fast-setting Rosendale Cement, which had been discovered just decades before in nearby Rosendale/Lawrenceville during the construction of the Delaware & Hudson Canal, and local bluestone were utilized for the abutments, the originals of which are still in place. 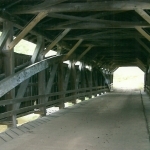 Rosencrans Wood crafted each of the Burr arches from mature White Pine trees, as confirmed by studies done when the bridge was rebuilt in 1968-1969. Paul Huth, now Director of Research Emeritus at the Mohonk Preserve, did an analysis of a cross section of a surviving arch timber, including doing increment bores, in 1977. He determined that the original White Pine log was some 27 inches in diameter when alive. He counted some 143 annual rings and estimated about an additional 10 rings had been lost in the arch preparation, thus determining that the tree that ultimately served as an arch started growing between 1682 and 1692.